Finely chop the garlic,onion, and ginger or blitz in the food processor. Place the mustard seeds in a heavy based pan over a medium heat.Once they begin to ‘pop’ add the oil and the onion mix. Cook for 5-10 minutes until the onion is softened.Add the spices and mix well, cook for a further five minutes. Add the lentils, stir to combine well. Pour over the tomatoes, coconut milk and add the sugar. Put the lid on and simmer for 25-30 minutes until the lentils are done. Meanwhile peel and chop the sweet potato into large chunks. Place in a medium pan and half fill with water. Bring to the boil and simmer until the potatoes are soft but not mushy.Drain and mash well with the butter and maple syrup. Chop the coriander and fold into the lentils. 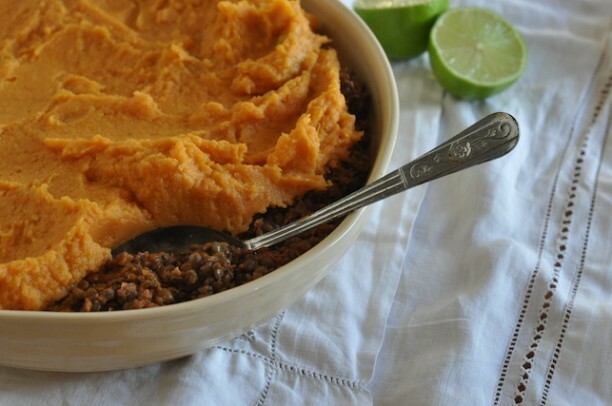 Spoon the lentil mixture into a large oven proof dish, top with the mashed sweet potato and bake for 15-20 minutes at 180C until piping hot. Serve with lime wedges.